I took today's photo with the kitchen light turned off and no flash. It's a lot better than last week's photo with the bright fluorescent light washing out the picture. Just as I feared, Kroger was out of the 69-cents pound chicken thighs. I bought that pork roast instead. My husband prefers "white meat" chicken and pork so I stocked up on boneless breasts too while they were on sale. I didn't do any shopping on Tuesday this week because there wasn't anything that I really needed from the stores that I go to that day. Instead we went to the Treasures of the Heart charity shop and I bought a pair of jeans, a pair of shorts and six tops for just under $30. Included in the price were also a couple of books for Jerry and three blue and white plates that were a dollar each. I hadn't been to the charity shop since back before Christmas. I actually would have spent a bit more this week if I hadn't forgotten about buying the chicken that was on sale at Kroger. I know that I had it written down on the rough draft of my shopping list but it somehow missed getting on my final list. It's a shame because 69-cents pound is a very good price on bone-in chicken thighs. I don't really want to make another trip to Kroger just for chicken so I might stop by there next Tuesday while I'm out and it will be the last day of the sale. Unfortunately, the cost of the chicken will count toward next week's shopping bill. I noticed something odd on my Walmart receipt. For some crazy reason, there is tax on bar soap but not on liquid hand soap. Also, there's no tax on toothpaste. I'm going to try Kroger's sugar free pickle relish and see if I like it. I bought their brand once several years ago and didn't like it as well as Mt. Olive's. But, Mt. Olive has apparently changed the flavor of theirs and I don't like it anymore. I'm hoping that Kroger's is better than the new Mt. Olive formula. It's a shame because I've been buying Mt. Olive relish for years and years and liked the flavor of it. Why do companies have to mess with products that people like as they are? 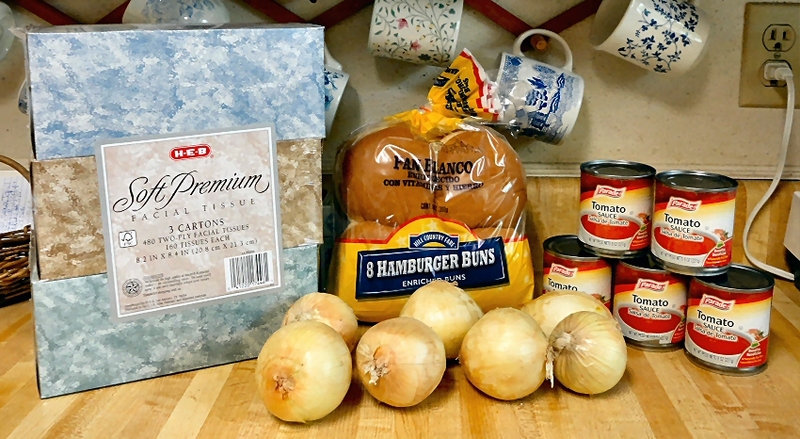 We had to replace the fluorescent light bulbs in the kitchen the other day and I found out today that I can no longer take nice photos of my groceries like I used to get with the old bulbs. The new one is very bright and bluish and the photos came out washed out and the colors are all wrong. I did what I could to fix up the photo in my graphics program but there's only so much I can do. Next week I will try taking the photos without the light on and see if that works. Since I don't use a flash, I'm not sure if there's enough light in the kitchen with the ceiling light off but we'll see. My son borrowed my camera this week while he's on vacation so I've decided to just take the week off from blogging since I can't take any photos. See you next week. I got a great deal on the pork roast at Kroger. 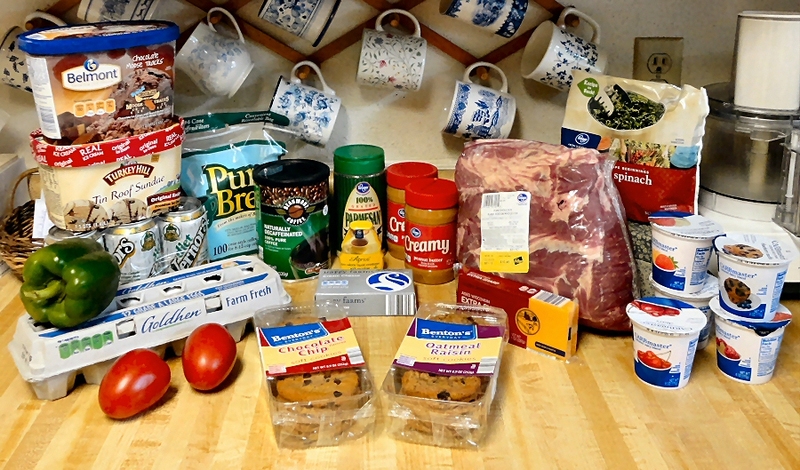 They were on sale for 99-cents pound this week plus I had a coupon good for $2.00 off a $10 or more meat purchase. Luckily, they had one roast that was just over $10.00. The rest of them were all just under that. I'll be using the green pepper and tomatoes to make Undercover Chicken tonight. It's simple to make and we both love it. Instead of Italian dressing, I use HEB's Creamy Garlic Caesar dressing. I grew up in the Detroit area in Michigan so, when I saw the marked down Vernors ginger ale in the clearance bin at Kroger, I had to buy it. It was a special treat to have a glass of Vernors during the holidays and other family gatherings. Back then, you didn't drink "pop" every day like people do now. 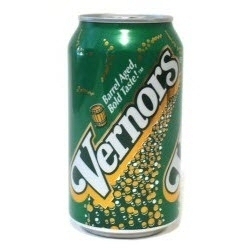 If you've never heard of Vernors, HERE is a Huffington Post article about it. Until I read that article just now, I'd totally forgotten about Boston coolers. Oh boy, were those ever yummy. They were also a Detroit creation. A Boston cooler is just like a root beer float but with Vernors ginger ale instead of root beer. A Boston cooler is a hundred times better than a root beer float and I loved those too. The "Kobe" ground beef that I bought on Tuesday made very tasty hamburgers. The meat seemed to have a little more flavor than the cheaper ground beef that I usually buy. It wouldn't be worth paying more for though. The cheap kind tastes just fine and has more fat in it. I have no idea why but Kroger gave me the senior discount on the Turkey Hill ice cream that I bought there today. Maybe the company is owned by Kroger or something. The CARBmaster yogurt is on sale this week 3/$1.00. It has been years since they've had it on sale but 40-cents isn't a bad price. Today was definitely "meat day". 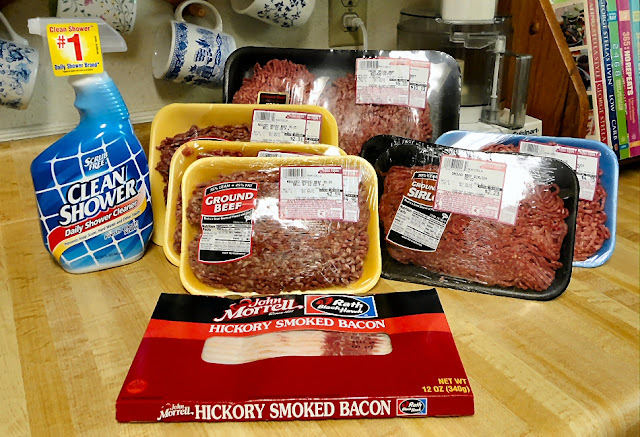 Food Town had several packages of ground beef marked down to $1.99lb. Usually for that price they only have the regular "ground beef". But, today they had an assortment. 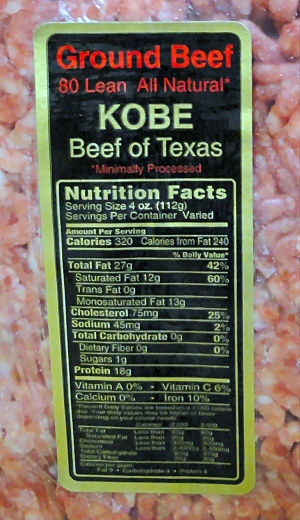 I got some ground beef, some ground chuck, ground sirloin and one package of "Kobe Beef of Texas". I put all the smaller packages in the freezer right away. 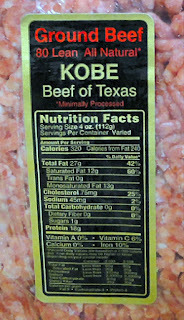 The "Kobe Beef of Texas" is in the larger 2 1/2 pound package and I'm going to use it to make burgers tonight. I'm curious to see what's so special about it.